The giant white oak tree at the intersection of several paths south of the gap between Moore and Warren Colleges is nothing short of magnificant. No other tree in the arboretum comes close to its 34.5 m (113 ft.) crown spread and it is probably one of the ten tallest trees at Vanderbilt with its height of 28 m (92 ft.). What could be a more fitting mascot for the university that has adopted the white oak leaf and acorn as its symbol! 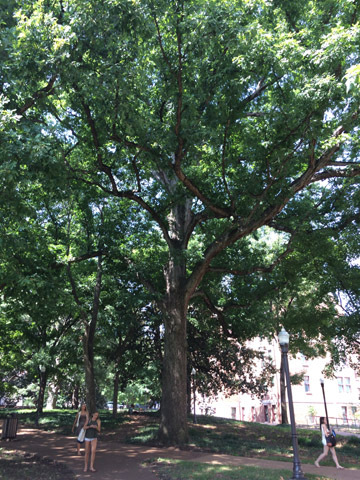 For over a hundred years, this tree has witnessed the movement of many students under its branches. During the first decades after the university was founded, there was a small ornamental pool near this spot in the direction of Kirkland Hall. The main path from "Old Main" (as Kirkland was called at that time) to 21st Ave. S. went past the pool and this tree. To the east and south was the original Dudley Field (later renamed Curry Field), where baseball and football games were played before the new fields were constructed on the west side of campus. Spectators probably sat in the shade of this tree as they watched the games. The name "Curry Field" is still applied to the lawn between Wilson and Furman Halls. This oak can be seen at the upper left of a photo from the 1940's. This organism is a living specimen that is part of the  Vanderbilt University Arboretum  with the local identifier 2-161.